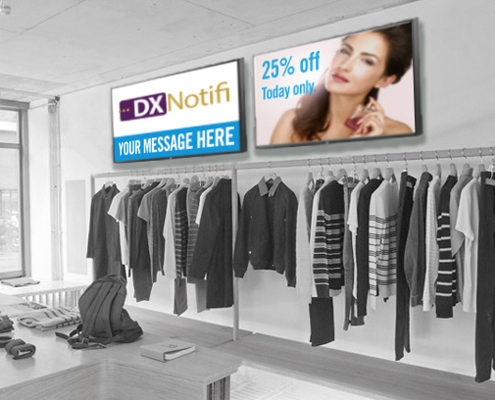 DXNotifi provides an end-to-end digital signage and mass notification service that enables you to create, manage, and display digital content across multiple devices, locations, and networks. The solution is entirely Azure Cloud-based and requires no on-premises server infrastructure. 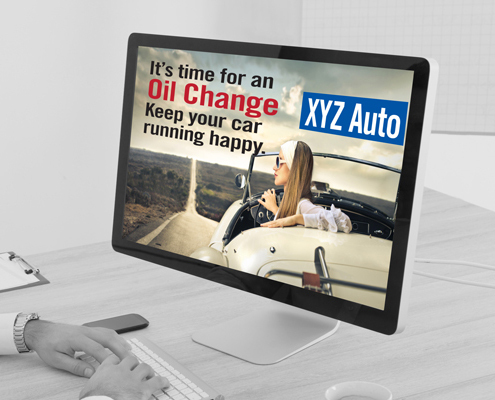 DXNotifi® uses displays you already have so there's no need for big new monitors or expensive servers. Plug a small device into your TV, go through a simple setup process, and you're up and running! We've designed DXNotifi's software with the end user in mind, meaning very little training is needed to turn you and your teams into power users. Many digital signage solutions today cost thousands of dollars to buy, and thousands to maintain. Not with DXNotifi® - Contact us to learn more about what your scenario would cost. Whether you've got small monitors sitting on desktops or giant displays hanging in a museum, DXNotifi was designed to work seamlessly with virtually any display you have. We built it with that fact in mind, so your presentations scale to the size of your display automatically and always look great. 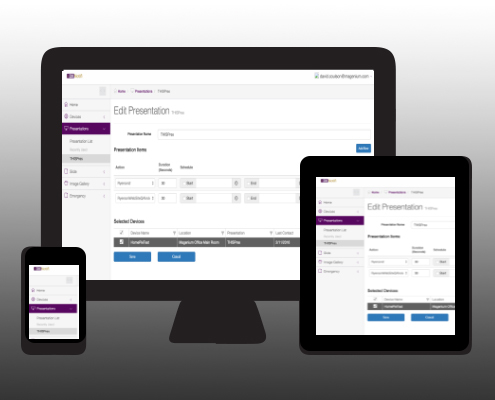 Because DXNotifi is a web-based application, you can log in from anywhere using any device and quickly build presentations using a drag and drop interface. You can test your presentations to see how they look and then push them out to your displays no matter where you are. DXNotifi can help you display live updates, emergency broadcasts, recorded video, news and social content - all without costly servers. Since it's cloud-based, you don't have to worry about storage limits. Customer engagement starts by creating visually compelling, targeted, interactive content using images. DXNotifi adds Dynamic and Static capabilities to this along with the power of video, sound, and an interactive (Touch and Mobile) aspect that will bring brands to life, accelerate communication, and influence purchasing decisions. Our ability to utilize touch and create content that uses QR Codes can create a rich content experience with interactive display unmatched by others. DXNotifi allows you to update and deliver content to any screen, anywhere, at any time. Whether you are projecting to mobile, tablets or large format displays, DXNotifi allows you to leverage real time data analytics to refine and optimize messaging based on customer engagement. We leverage the power of Windows 10, allowing each DXNotifi device to seamlessly connect to any HDMI capable display. These displays can be indoor or outdoor TV’s, multiscreen, or advanced wall systems. 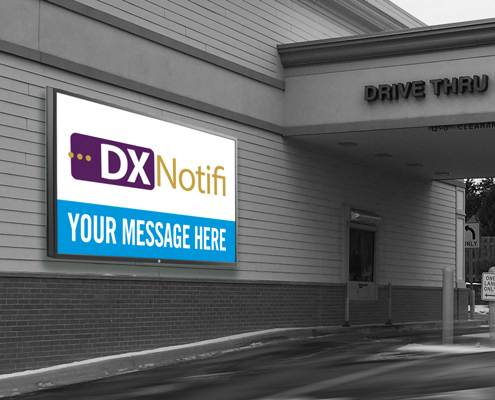 DXNotifi combines traditional digital signage with mass notification capabilities, enabling quick effective communication. Universities across the country have to be able to display all sorts of information from special events and game day parking restrictions to having a centralized emergency broadcast system. Innovation Park at Notre Dame is one of our customers and a great example of how DXNotifi can power up display communications with ease. Museums can add powerful new imagery to exhibits with interactive signage from DXNotifi. OdySea Aquarium, one of the largest aquariums in the United States, uses DXNotifi to showcase sales and special events, provide audiences with dynamic information about each exhibit, and even keep patrons entertained while they wait in line. Gone are the days where fairgrounds have to rely on expensive printed signs and billboards. Now you can show your visitors up-to-the-minute showcase information, a schedule of events, and even provide weather warnings in real time with DXNotifi. DXNotifi was designed and developed by Magenium Solutions. Magenium Solutions is an IT consulting services firm headquartered outside Chicago with branch offices in Minnesota, Arizona, Florida and Georgia. Dedicated to delivering technology solutions that solve problems and move business forward, Magenium is a trusted partner to hundreds of companies nationwide.